Rosa Parks was an African American seamstress who is remembered for her bravery and how she helped bring racial segregation in America to an end. On December 1, 1955 she was ordered to give up her seat to a white passenger on a Montgomery Alabama bus. When she refused to move, the bus driver had her arrested. She was fined for breaking the law. According to Alabama law at that time, white people sat in the front rows of a bus and black people sat in the back rows. When the black section was full they had to stand. When more white people boarded the bus the blacks had to get up and give their seats to the whites. Sometimes blacks had to get on the bus at the front, pay the fare to the bus driver, get off and enter again through the back door. Parks’ action led to the Montgomery Bus Boycott, which lasted for over a year. It was led by Martin Luther King. He urged African Americans in Montgomery not to use the city buses and demanded an end to segregation. In the months during the boycott African Americans in Montgomery were threatened and attacked. In 1956 the American Supreme Court ruled that segregation on buses was illegal. What Rosa Parks did gave the civil rights movement more momentum. In the years that followed African Americans fought harder for equal rights until, finally, in 1964, the Civil Rights Act was passed. 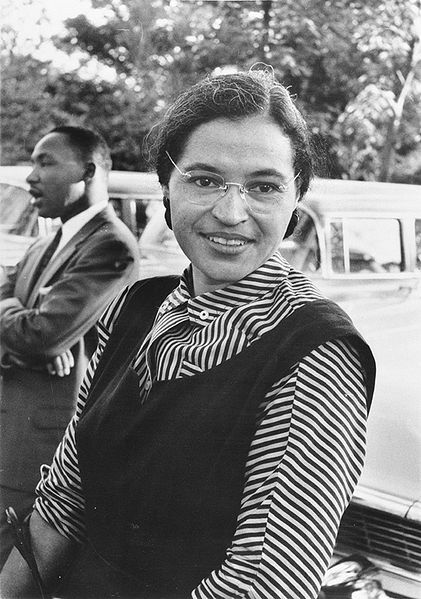 Rosa Parks is often called the mother of the civil rights movement. In her later life she remained an activist and fought for racial justice. After the incident Rosa Parks lost her job and moved to Detroit where she spent the rest of her life. She founded an institute that shows young people how important civil rights are. Rosa Parks died in 2002 at the age of 92.